Every time I walk into a Lush I am greeted by wonderful aromas of intoxicatingly yummy lotions, shower gels and so many more interesting concoctions. I ran out of the last of my Lush soaps a few months ago and haven't indulged in their other bits for far too long. I had tried to stay away from Lush for most of the year to avoid shelling out more than my budget can handle but I couldn't wait any longer to try a few new (at least to me) products I've had on my mind for some time now. Ro's Argan Body Conditioner is a post body wash treatment that is slathered all over the skin and then rinsed off to inject the skin with moisture. As someone with chronically dry skin, I was craving a product that would make moisturizing more fun and less of a chore. I'm also obsessed with rose scents at the moment which was another reason this was a must try. Charity Pot is a special purchase because 100% of the proceeds go directly to a grassroots charity. I was in the market for a new body lotion to try out due to my incredibly dry skin and the added incentive of somewhat contributing to a good cause was enough to justify adding this to my shopping basket. The Almond and Coconut Smoothie was a total splurge simply because I do not need a special body wash. This is purely for relaxation and pampering purposes and I use this in place of body soap. So far, I like it. Lastly, I asked the lovely lady at Lush to recommend me a hair treatment for the drier weather and she provided me with a very generous sample of R&B, a "hair finisher". It's essentially an after shower hair product that nourishes the hair and prevents fly-aways. Individual reviews on all of these products will be popping up on the blog within the next few weeks so stay tuned for more details! I'm also planning a whole post just on pampering products and you can bet that a few of these Lush goodies will be featured in that edit. Have you tried any of these products? What are some of your favorite Lush products or things you're interested in getting? 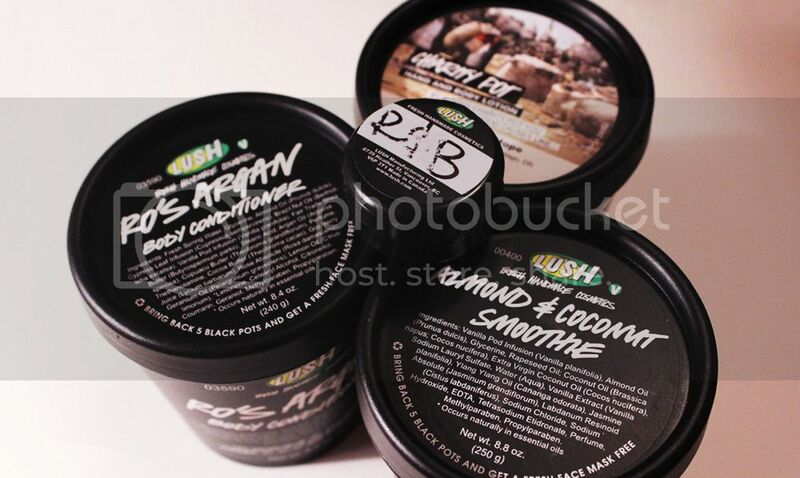 ahh the almond and coconut smoothie is one of my favorite products from lush! I need to go pick up another one!